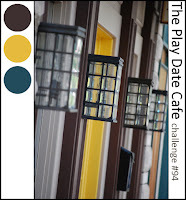 The colors for this week's Play Date Cafe challenge were perfect for my husband's birthday card. 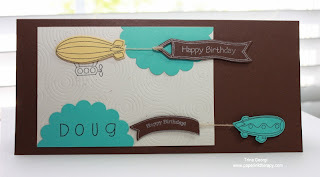 ﻿I'm so lovin' this stamp set and dies from Taylored Expressions...the moment I saw them, I knew I had to have them. The sentiment on the smaller banner is from Papertrey Ink's "Fly Away" set, which I think would be great to pair up with this one...hmmm....I just may have to go give it a try, right after I'm done here. Fab take on the colours this week! Love those HB banners and the personalised cloud! Super cute, and I love that you've personalized it! Thanks so much for playing along with us this week at The Play Date Cafe! This is so fun the way you've done the little banners! Love your take on our colours. Thanks for playing along with us at The Play Date Cafe this week! ahh wow I love this card it's so much fun! Great images!